Your jack-o-lantern can be a perfect, zero-waste holiday decoration! After carving your masterpiece, toast your pumpkin seeds for a delicious snack and add the stringy insides to your compost pile. 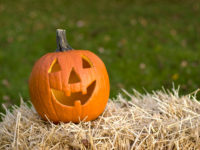 Once Halloween is over, cut your jack-o-lantern into chunks and add those to the compost pile or bin, too. Or let the squirrels have a go at it first for a tasty snack!